(CNN) -- A powerful earthquake struck New Zealand early Saturday, sending surprised residents into the streets and causing some buildings to collapse, though there were no immediate reports of any serious injuries or major damage, emergency officials said. "The house felt like it was on wheels, like it was rolling around on marbles," resident Hadlee Wright told CNN's "Rick's List" just hours after the 7.0-magnitude earthquake hit near Christchurch, New Zealand. 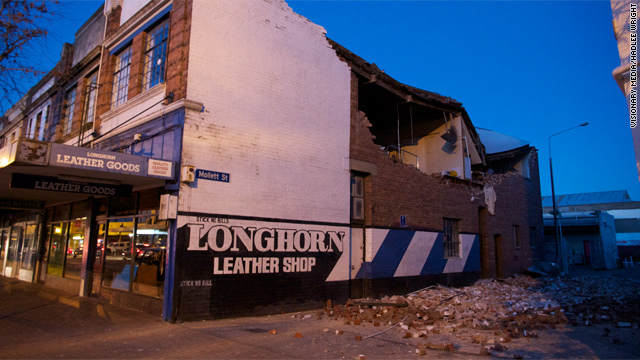 Pictures that Wright took of the darkened city show collapsed buildings and streets littered with broken bits of brick and rock. The quake had a magnitude of 7.0, down from an initial assessment of 7.4, the U.S. Geological Survey said. It struck about 35 miles from Christchurch, a city with a population of roughly 386,000 people. An aftershock with a magnitude of 5.7 struck not far from the epicenter about 20 minutes later, the survey said. Freakshow did you guys feel anything at all in Aussie?? That tower connected to it Is the WIZARDS SPIRE ONLY THE WIZARD AND NO-ONE ELSE NOT EVEN THE PRIME MINISTER OF NEW ZEALAND IS ALLOWED TO GO UP THERE. Let's Just say the WIZARD IS VERY VERY OLD NO-ONE KNOW'S HOW OLD BUT HE'S BEEN THERE FOR A VERY VERY LONG TIME!! Here is a pic of the other side! Is it just me or...NAZI SYMBOLS!!! WELLINGTON — Aftershocks rocked New Zealand's second-biggest city on Monday causing further damage and forcing authorities to extend a state of emergency after the country's most damaging earthquake in 80 years. More than 20 aftershocks, the strongest with a magnitude of 4.8, were felt through Monday, sending already loose masonry and bricks in damaged buildings crashing into the streets. However, despite early estimates of a $1.4 billion repair bill, financial markets were little affected and followed broader market moves, which pushed the New Zealand dollar higher and debt lower. Prime Minister John Key said as many as 100,000 homes, about two out of every three in the region, may have been damaged to some degree by the magnitude 7.1 quake which struck early on Saturday. Big ole Texas hattip to Derail at GLP for pointing the way. JAKARTA, Indonesia — A magnitude 7.2 quake struck off Indonesia, just one minute after a strong 6.6 tremor hit a few miles north, the U.S. Geological Survey reported Wednesday. The USGS said the second quake, which hit at 2:11 a.m. on Thursday, was only 7.6 miles deep and centered 68 miles northwest of Dobo, in the Aru Islands, very close to the first quake. MEXICO CITY — Two earthquakes struck northern Mexico Monday just minutes apart, the U.S. Geological Survey said, but there were no immediate reports of serious damage or injuries. The first quake was 5.9 magnitude and hit about 84 miles west-southwest of Navolato, in the mostly rural area of Sinaloa, at a depth of 8.1 miles the USGS said. The second quake, measured at a magnitude of 5.5, occurred about six minutes later, 66 miles east of La Paz in Baja California Sur. I just read about this one, too, Ruts. One seismologist stated the only reason there wasn't damage akin to Haiti was because it was so deep. Gave me the chills to think about South America shifting. We'll have to see what happens next. CNN) -- A 7.1-magnitude earthquake struck the central coastal area of Chile on Sunday, some 70 kilometers (45 miles) northwest of Temuco, the U.S. Geological Survey said. There were no immediate reports of major damage or injury. The quake, which stuck around 5:20 p.m. (3:20 p.m. ET), was felt as far away as Santiago, roughly 595 km (370 miles) north of where the USGS said the quake occurred. The earthquake was some 17 km (10.5 miles) deep, the USGS said. The ring of fire is ringing like a bell struck to the perfect tone, vibrating endlessly. January 12, 2011 – We’ve seen dense spectral patterns of seismic activity before but this one is making us take note. The region has experienced more than 280 seismic tremors of varying degrees over the last 14 days. Something major is brewing in the region. I consider this one to be linked to the Sun event yeterday! This is way North! Not seen a quake here for a looong time??!?? This is so close to the coast!!! CHRISTCHURCH, New Zealand — Cheers erupted Wednesday as rescuers pulled a woman from a major building shattered in New Zealand's devastating earthquake, but the mood was dismal at another wreckage where police said all hopes of survivors were finished. The confirmed death toll from Tuesday's magnitude-6.3 quake near the city of Christchurch rose to 75, and officials said it was almost sure to climb further. Police believe 100 people may have died in one building alone. Some 300 people were listed as missing, as rescuers raced to find trapped survivors and imposed a strict nighttime curfew on the worst-hit areas. One of the city's tallest buildings, the 27-floor Hotel Grand Chancellor, was in imminent danger of collapsing, with one corner sinking lower in the ground and the facade showing major buckling, Fire Service commander Mike Hall said. An emergency team reunited Ann Bodkin with her husband after a painstaking rescue from the twisted metal and concrete remains of the Pyne Gould Guinness building. As she emerged, giant sunbeams burst through the city's gray, drizzly weather. CHRISTCHURCH, New Zealand — The sister and brother sat huddled Wednesday on sodden grass, staring at the smoldering remains of an office tower that collapsed with their mother inside. They hadn't heard from their mother since a powerful earthquake tore through one of New Zealand's largest cities a day earlier, killing at least 75 people and leaving some 300 missing in the rubble. Still, there was hope. "My mum is superwoman, she'd do anything," Manning's 18-year-old daughter Lizzy said, tears streaming down her face. Just then, a police officer approached and knelt before Lizzy and her 15-year-old brother Kent in the rain. "I have some horrible news..." the officer began. The teens' faces crumpled, and their father wrapped them in an embrace as he gently broke the news that their mother, Donna Manning, was presumed dead along with everyone else trapped inside the building. It was a dark moment that was repeated many times over Wednesday as rescuers searched for any signs of life in the twisted rubble of Christchurch, as Prime Minister John Key declared the quake a national disaster and analysts estimated its cost at up to $12 billion. Hundreds of troops, police and emergency workers raced against time and aftershocks that threatened to collapse more buildings. They picked gingerly through the ruins, poking heat-seeking cameras into gaps between tumbles of bricks and sending sniffer dogs over concrete slabs. 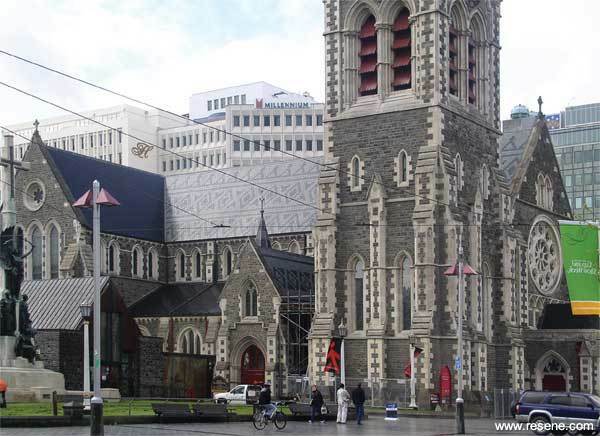 WELLINGTON — New Zealand rescue teams have given up hope of finding any more survivors from last week's devastating earthquake and will now look to recover the remaining victims, officials said on Thursday. The head of the civil defense said there had been no live rescues since Wednesday of last week and the grim reality was that no more would be found. "As time has gone on the chances of finding others alive has diminished. Sadly there comes a point where the response effort has to shift from rescue to the recovery of bodies, and regrettably we have reached that point," said John Hamilton. The confirmed death toll from the force 6.3 quake, which struck on Feb 22 in the early afternoon, is 161, with police estimating that the final toll will be around 240. Two Israeli backpackers were the first foreigners named among the dead as the painstaking work of confirming the identities of scores of others gained pace Thursday. Officials expect the number of foreigners killed in to rise into the dozens, many of them Asian students and staff at an English-language school that was in an office building that collapsed. The process of identifying the victims has been slowed by the extensive injuries to people who were crushed, and by the task of picking through the vast amount of rubble. The 8.9 magnitude earthquake is among the top 10 ever recorded and occurred on an irregular fault line where a smaller temblor would be expected. The magnitude 8.9 earthquake that struck Friday off the coast of Japan "is going to be among the top 10 earthquakes recorded since we have had seismographs," said seismologist Susan Hough of the U.S. Geological Survey in Pasadena. "It's bigger than any known historic earthquake in Japan, and bigger than expectations for that area." There have been at least two aftershocks of magnitude 7 or greater, and researchers expect more. The quake was a "perfect storm for tsunami generation," Hough said — it was large in magnitude and very shallow. The quake was so close to land, about 80 miles offshore, that people on shore really had no warning that a 15-foot wave was imminent. But that wave is now spreading out in the opposite direction at about 500 mph, the speed of a jet airplane. It should hit Hawaii just before 3 a.m. local time and should begin reaching the West Coast around 8 a.m. PST. Residents near a Tokyo Electric Power Co. nuclear reactor were ordered to evacuate because of a possible radiation leak as Japan’s strongest earthquake in a century shut power plants and oil refineries. Firefighters continued to battle a blaze at Cosmo Oil Co.’s refinery, .... The blaze started at the 220,000 barrel-a-day plant’s storage tanks...JX Nippon Oil & Energy Corp. said it shut its refineries in Sendai, Kashima, and Negishi. Millions of homes were without electricity as utilities shut 11 nuclear power reactors. The shutdowns amount to about 20 percent of Japan’s 4.6 million barrels a day refining capacity and about 20 percent, or 12 gigawatts, of Japan’s total installed nuclear capacity, Sanford C. Bernstein analysts including Neil Beveridge said in a note today. Honolulu (CNN) -- Tsunami waves resulting from Japan's deadly earthquake rolled onto the Hawaiian Islands, bringing waves of nearly 7 feet to a harbor in Maui, authorities said. The West Coast was bracing for waves to come onto shore from Washington to California. No significant damage had been reported in Hawaii two hours after the first waves arrived, but officials said they will know more after sunrise. The Pacific Tsunami Warning Center predicted the waves, which came in about every 15 minutes, "are not going to be a major damaging event" for Hawaii, but will cause scattered damage, particularly to harbors and coastal facilities. Earthquake in Japan ! 9.8 on Ricter scale 30 ft sunommi . Nuclear reactor shut down due to coolant leak from earthquake. Evacuations are under way!